The Eastern Corridor is an expensive state DOT highway project searching for a reason to exist. The $1.4 billion proposal from Ohio DOT is ostensibly intended to reduce commute times from Cincinnati’s far eastern bedroom communities to downtown. The project, a remnant of 1960s-era road planning, would create a commuter highway through the eastern Cincinnati region by widening and partially rerouting State Route 32, as well as widening Red Bank Road. The plan also contains commuter rail and bike infrastructure elements. Proponents, like the Cincinnati Chamber of Commerce, say it will shorten car commutes and promote job development in the eastern suburbs [PDF]. But even with those multi-modal goodies, nobody seems to like this highway — not even the towns it is designed to serve, according to the Cincinnati Enquirer. Newtown (population 2,600) opposes it. The village of Mariemont (population 3,400) opposes it. Madisonville, an eastern Cincinnati neighborhood that would be served by the road, opposes it. “We don’t need it,” Newtown Mayor Curt Cosby told the Enquirer. The Enquirer editorialized that Ohio DOT is “wasting” money on the Eastern Corridor that would be better spent on other projects. Passenger rail proponents don’t like it either, since the 17-mile commuter line would go through sparsely populated areas and is expected to produce very little bang for the buck. Only 3,400 trips per day are projected by 2030, and only three of the 10 stops along the route were found to have significant development potential, according to a study by the engineering firm HDR. In Anderson Township (population 44,000, about a 20-minute drive from downtown Cincinnati), where local officials do support the road, trustee Russell Jackson told the Enquirer that “nobody in the local communities really sees this incredible benefit to building this thing.” Even the project’s biggest supporter, Hamilton County Commissioner Todd Portune, objects to aspects of the state’s plan. So with resistance to the highway so strong and pervasive, has Ohio DOT decided to shelve it? Nope. Instead, the Federal Highway Administration recently hired a third-party mediator to reach an agreement between Ohio DOT and the highway opponents. The mediator’s report recommended eight possibilities. One is a “no-build” option, and the other seven are less harmful variations on the Eastern Corridor idea. Ohio DOT is expected to announce its decision soon. The Eastern Corridor, particularly its friendly-named “Little Miami Parkway,” is a stalking horse for an Interstate-ready, eight-lane bridge over a Federally designated “Wild and Scenic River” which will eventually carry I-74 through Cincinnati and on to North Carolina where sections of it are in place and under construction today. And then a developer of suburban subdivisions floats some Brent Spence Bridge “idea” to save money by building a bypass highway through land he could develop and then, I think, back into Newtown or connecting in Eastern Corridor disputed area. None of this should be built. Neither the highway nor the rail line. The rail line serves outside of downtown and Milford no major population or job center. Much of the land along this line is unbuildable hillsides or flood plains. This is simply a poor investment of tax dollars. DOT has not responded as to what expected improvements in commute times would be. Population growth in Clermont County has stabilized and with the state goal of the new road generating economic development along the corridor, one can only assume that any improvements in commute times would be lost once new stoplights and access points are placed along the “improved” corridor. Do not believe the multi-modal window dressing. 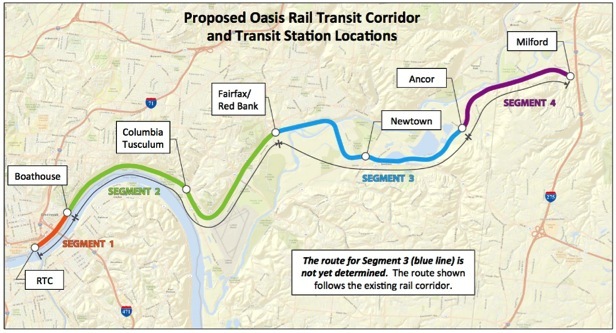 Commuter rail will get thrown out of the plan as soon as the EC gets approved. Anderson Township is one of the most car oriented cities in the region. I had a doctor’s appointment on its most busy thoroughfare last year and found that the Metro bus stopped a mile and a half from the office (we’re not talking abut a remote office either, but one next to a heavily trafficked shopping center.) There were almost no sidewalks on that walk, despite it being a busy, retail and professional oriented neighborhood. I actually had to walk over two miles back to catch a bus back into the city, because the busses at my first stop didn’t actually make a return trip for some reason. The two bikes I saw were also clearly unwelcome interlopers. This is an auto only development, but they’re so desperate for political support in the area that they’re trying to make it sound like it’s not. Sounds to me like all those cars in Anderson Twp need a way to efficiently get to and from downtown. I had a return appointment to the same doctor and borrowed my partner’s car, after learning my lesson that pedestrians are unwelcome. The 275/471 route to downtown through KY took about 15 to 20 minutes, it seemed to work just fine. This new road does not need to exist, particularly since nobody where it actually passes through wants it. The project absolutely does not bisect Mariemont. Wooster Pike does that. Compare the $ invested in a downtown street car debacle to a people moving commuter rail from the burb’s… How about expanding existing highway routes from the eastern ‘burbs – 275, 471, 71? If it was possible to expand 32 without destroying Newtown, great but don’t see it being possible. The past two engineers on the project. It connects the suburbs to downtown with much of that connection on an existing parkway. Hardly a Trojan horse. The project is a reroute of that existing state route. Another omission of this 1000 foot flyover piece. Yes, you’re right, we should take the engineers’ word for it. This project is not planned to benefit Anderson specifically but rather the eastern portion of Hamilton county and Clermont county. Incidently, there are plans in the works to address the sidewalk issues in Anderson. Maybe something for Bicycles will follow. Pure waste of taxpayer dollars. These funds are needed for the Brent Spense Bridge replacement not this DOT engineers’ make work project. Portune is just looking down the road to higher office, he’s looking to attract Clermont County and Anderson Township votes -that’s why he’s in favor of it (Mariemont, Madisonville, Newtown votes are a drop in the hat to what he can attract further east). If the ODOT were honest they realize we are in a minimal growth region (it’s already happened decades ago) this simply just aids in shifting the existing population around. Why a new road when the infrastructure around us is crumbling down? ODOT is smart enough to know that converting US-32 to an interstate highway in one step would never fly with the general public. Instead, it will be rerouted first, then gradually grade separated. Much like how OH-32 east of Cincinnati is a 4-lane highway with some interchanges and occasional stoplights. Replace the remaining stoplights with interchanges and it’s up to interstate highway standards. People need to actually drive through new town and mariemont at 7:45am everyday. Its a complete logjam, this needs to be done. Imagine not having i71, because it went through Montgomery, Montgomery is thriving even with 71 right through the middle of it. Follows this model and well be fine. 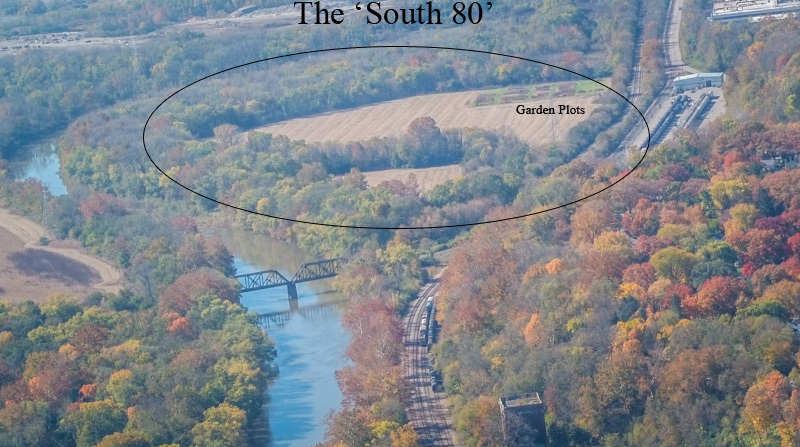 There is so much amazing land along 32, Batavia and my orab could be mason and west chester in size and value it would bring to the area. No. The towns don’t want it and the price tag is enormous. If they want additional capacity, built out the commuter rail. It can carry many more people while using less space and tax payer dollars. Imagine taking approaches to congestion other than “more highways” and “more lanes”. Imagine a boost in carpooling. Imagine more telecommuting. Imagine a more robust public transportation system that serves more peoples’ needs. Imagine an increase in kids walking to school and people walking to go to work or do errands more often. The only road we have talked about in Anderson is the ANCOR connector road. This is NOT the Eastern Corridor and I have no idea what this “blogger” is referring to when she says “Anderson’s local officials” support the plan. As a tax-paying member of a town very near Mt. Orab – WE DON’T WANT IT! Leave us alone. We live out here (and commute the 35+ miles to work every day) because we LIKE IT QUIET. If we wanted to live in a place the size of Mason or West Chester, guess what, we would live in Mason or West Chester. Us “country folk” want to be left alone. If you have a problem driving through Mariemont at 7:45am, leave earlier or go a different way (32, 275, 471, 71, etc). But do not bring the congestion, traffic, trouble and crime out to our neighborhoods simply because “there is so much amazing LAND along 32”.